Work from Home Data Researchers Needed for the Cannabis Industry, 20 Hrs./Wk. 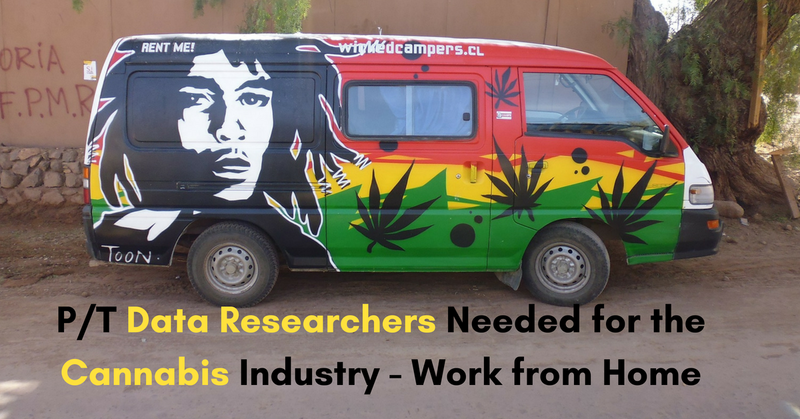 If you like to do research, Cannabiz Media continues to advertise for virtual part-time Data Researchers to help maintain its database on the marijuana industry. The listing doesn’t mention the pay rate. We’ve emailed the company for a figure and will update here when we hear back. Cannabiz Media keeps a large database on marijuana licenses, so journalists, businesspeople, investors and others can track how the cannabis industry is growing and developing. In this job you’d be doing things like scanning news feeds for stories about licenses, creating charts in Excel from statistics and other data, doing fact-checking on legal and financial and regulatory info, and doing research from a wide variety of sources, online and off-. The listing doesn’t say what the offline research would involve. But we’re assuming it’s via phone, since Researchers can apparently work from anywhere in the US. However, the company hasn’t confirmed this. For this job, you’ll need to be detail-oriented and organized, able to work with minimal supervision, be familiar with Excel, Google Apps (Docs and Sheets), Gmail and Chrome, and have strong written and verbal communication skills. Extra points if you’ve done academic or legal research. As with so many work from home jobs, you’ll probably also get extra credit if you’ve worked from home before, so be sure to mention it if you have! To go straight to the job listing, click here. For more jobs like this one, click here. To be the first to hear about our jobs and side gigs, like our Facebook page and check your feed for our posts. Good luck in your work from home plans! This entry was posted in Part-Time Jobs, Work at Home Jobs and tagged Cannabiz Media. Bookmark the permalink.